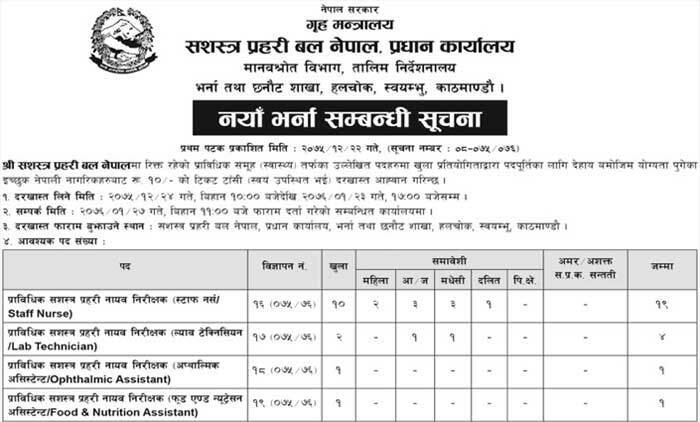 Government of Nepal, Ministry of Home Affairs, Armed Police Force (APF) Nepal, Human Resource Department announces vacancy (published on Gorkhapatra, 5 April 2019) for various positions. Eligible Nepalese citizen are requested to submit their application to Armed Police Force Nepal, Head Office, Admission and Selection Department, Halchowk after affixing the stamps of Rs. 10. Candidates meeting the requirements mentioned in the notice (see below) may apply with their certificates, citizenship and recent passport size photographs.